Oh…btw, I do have the “Hamilton Beach Slow Cooker” AND “Crockpot”, like them both. 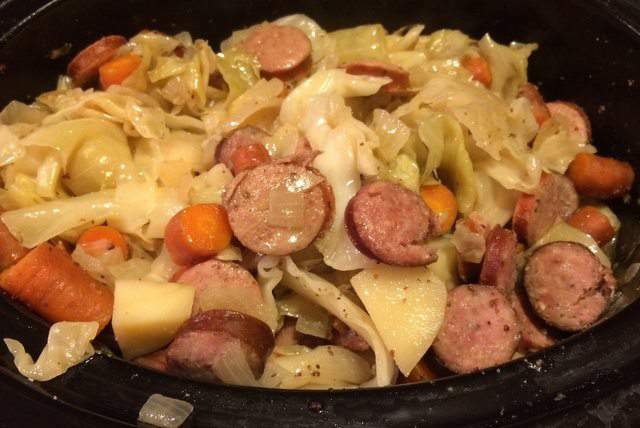 Layer the cabbage, onion, potatoes, carrots, and sausage in a 5 or 6 qt. crockpot. Whisk together the juice, mustard, vinegar and pour over crockpot ingredients. I’ve also cooked it on high for 1 hour and then on low for 3-4 hours when I forget to get it ready earlier in the day. I love this recipe because it is quick, frugal and delicious. My crockpot is my work horse! If you’re looking for a good slow cooker, I highly recommend this Hamilton Beach 6 qt version. I’ve had this slow cooker for a number of years now and have been very, very happy with it. .It’s not TOO warm for this meal, well…to us ever, but for anyone…it’s a beautiful day!